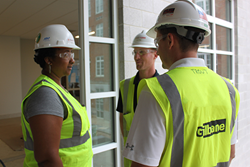 Leading global construction and facilities-related services firm, Gilbane Building Company was recently recognized by their national client, AT&T, with the Supplier Diversity Crystal Award. This award is bestowed upon prime suppliers to AT&T who have shown outstanding diversity utilization. In 2015, AT&T continued its strong commitment to Supplier Diversity, spending over $13.7B with minority, women, and disabled veteran owned businesses. The Prime Supplier program contributed over $2.4B to this success through their diversity inclusion efforts. Gilbane, along with other Prime Suppliers, will be honored at the AT&T Supplier Conference in Dallas, Texas on June 8, 2016. Gilbane provides a full slate of construction and facilities-related services, from pre-construction planning and integrated consulting capabilities to comprehensive construction management, close-out and facility management services for clients across various markets. Founded in 1873 and still a privately held, family-owned company, Gilbane has more than 50 office locations around the world and is headquartered in Providence, Rhode Island.